I have been somewhat unhappy with how I am storing my stamps. While I love the CD cases on the one hand, I found that I had 4 (5,6,7 or more!) cases full of swirls and circles and flowers. A while back, I removed those from the CD cases and reorganized them into small craft storage boxes. That took up less space, but was a nightmare to riffle through to find what I wanted! I found myself settling for the first somewhat appropriate stamp I came across, rather than really looking at them all to find the “right” one. 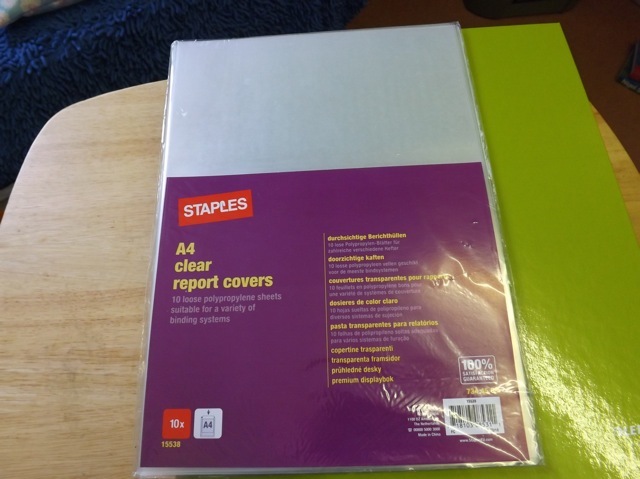 At the time I began sorting them into the boxes, I had bought some clear Report Covers from Staples. I took a clear stamp with me so I could test out if they would stick to the folder with some grip, and not fall off. 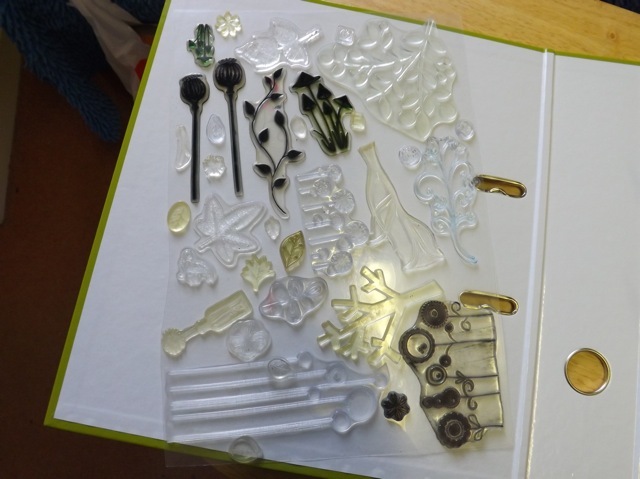 I cut up some of them to fit the box, and attached groups or sets of stamps to them in an effort to make finding the one I wanted a little easier. It wasn’t easier. I tried sticking them to the full report covers but wasn’t happy with the potential for them to slip off, if the “sticky” had worn off the back of the stamp. I washed them, which brought it back, mostly, but not quite enough for me to feel secure storing them that way. Then I promptly forgot all about it and just carried on with the boxes and the finding issues. While tidying up last week, I stumbled on an entire box of A4 page protectors. No idea why I bought them – maybe to house pages ripped out of mags into my own idea book? It hit me that storing the stamps on the report covers then slipping them into the PPs and into a binder would at least make the flipping through far easier. 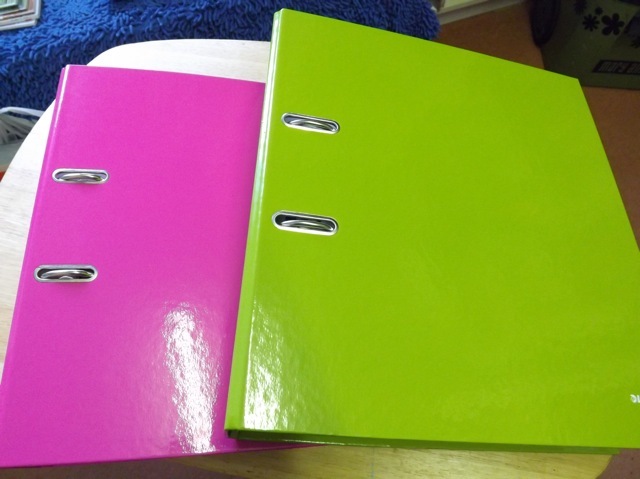 The colourful binders, nice quality and BIG, were priced 3 for 2 so quite cheap as well. I split the report covers down the spine (cutting off about 1/4 inch at the fold) which made them fit the page protectors perfectly. And I started sticking the stamps to them. When I found one that didn’t seem to adhere well, I just washed it and it stuck. I found I could get quite a lot of them onto a sheet! In cases where I hadn’t thrown away the original packaging, I simply taped then together so they fit the sleeve, forgoing the report cover step entirely. You can see on the left the two taped sets – actually one set, one background stamp. The real appeal to this is that the stamps, if they DO come loose from the report covers, they only fall into the page protector and not out onto the floor or in the bin! I am LOVING this method. And of course I had to have a look and see if someone else had the same idea – and of course they had. This video is pretty much the same thing, although she uses the report covers whole rather than cut in half, uses them specifically for her PTI stamps and she takes the extra step of adding the image labels from the stamp set. I think that helps, if you have them, although sticking together sets like on the left above accomplishes the same thing. In future I suspect I would be more inclined to save the packaging than I have been. At some point, I MAY be tempted to stamp all the images onto paper and add them, but I find I can tell enough about the stamp to know if I want to use it from the stamp itself, so that may be just more work than it is worth. I have three binders and a load of dividers (also from Staples) and I think that should accommodate all my clear stamps. 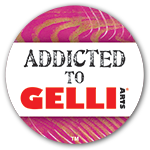 It also means I can then use the CD covers for any of my cling mounted stamps. Wood mount ones I have a LOT of but most of them are very specific (like the Stampotique ones) and as I will always have to look at least two places I feel adding the cling ones to the CD cases, which can be stored on the same shelf as the cling ones in binders, I still have a better chance of finding them. If that makes sense. 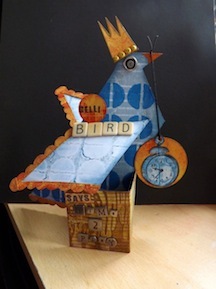 No matter HOW you do it, I simply cannot see a way to mix wood mount stamps in with the rest – you will always have to look at both storage methods. I love the lever binders – the can store so many sheets! – yet flip so easily. At this point I am unclear if I will have a smaller binder for my clear alphabets. I am leaning towards NOT, as I have only a few alphabet sets that are clear – MANY more that are either cling mount or foam or tiny wood mount ones – and the clear ones I tend to use as a full sheet for art journal-type things, instead of a stencil as more of a background than to spell out text. They fit in a couple of rolling drawer stack drawers and that has always worked well for me so no real point to changing them. The danger of reorganization tends to be that you get swept away, think something is going to work well then when it doesn’t you find you have wasted time and money and are still unhappy! I am already happy with this set up (it took me a while to be able to get out to Staples to find more of the raw supplies but I could see from just a couple of weeks of this new method, with only a few stamp styles, that this was working) so taking the plunge and the time to do them all. I really hope I won’t be eating my words in 6 months. If so, you are invited to laugh and point and make any derisory noises you like. Sorry that was all a bit wordy. But now I have a date with my CD cases – between getting them sorted and sorting that massive pile o’ scraps (still only dented, I fear) I am going to be very busy. At least, knock wood, there is no driveway shovelling to do today. DH has done it all (saving me and my back from further injury) but the poor guy has been exhausted and I would have felt compelled to go help had it needed doing AGAIN. With the Y of the drive I would bet it’s 60 metres at least! I hope it warms up soon and no more snow….. Categories: office supplies, organization, stamping | Tags: stamp organization, stamps | Permalink. i use a portable cd carry case/storage wallet that has the divider pockets secured in a zip case. These are designed to carry the weight of the cd so they don’t sag and they are easy to take to crops etc as they are close all the way round and are designed to be flipped through. I love the idea of page pockets containing the stamps; I’ve seen them sticking to the back of home-laminated stamped image sheets – so you see the image and the stamp is on the back of the laminated sheet (all inside the pocket). I am still looking to source at least one A5 zipped binder so that I could load it with a selection of A5 pockets and take it to crops/retreats – then nothing would fall out even if the folder was tipped upside down. For home use a lever arch file would be fine. I don’t know if you’re familiar with the My Creative Classroom website. They are currently having a free class on this very subject and there are loads of comments how others are tackling this problem. You have to sign up for their newsletter to get the free class. Registration is closing soon, so if you’re interested, you might want to check it out. 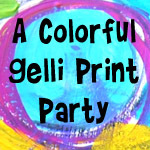 The website is http://www.mycreativeclassoom.com and the enrollment code is stamp13. In cleaning up and reorganizing my new craftroom, I came across a whiole bunch of plastic sleeves from Staples (same as yours) and some holders for Pokemon cards I had bought for grandson. I started to play around with them and ended up putting the smaller clear stamps in the Pokemon holders and the bigger ones in the other sleeves. I inserted a plain paper with the corresponding stamp on it and put some glue dots if it wouldn’t stick! Strange how we had the same idea! Although they do tend to buckle (already) I will try this for awhile until I find something better. The wooden stamps (but few) I keep in my drawer in a box! Thank goodness I have s many of them from DSs youth – and so glad I didn’t throw them away in a fit of tidying LOL! That would have been JUST like me! Thanks again for your addd info. 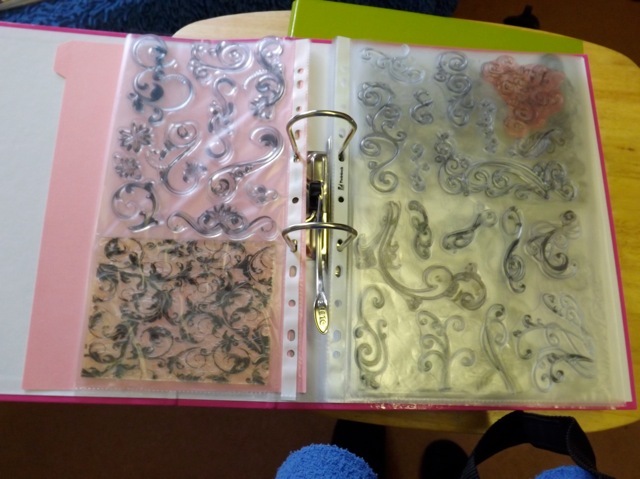 It´s great to hear, how others are storing their clearstamps, as I´ve always found it hard to find a really good way of storing these, cause either it takes too much space or they do fall out, so it´s nice to see s way that actually seems to work well, and maybe it can be used for the dies too, as they´re always the same problem I think. So will have to look more into this way and see, if it can work for me too. Thanks so much for sharing this. I started off with CD Cases but that never really worked, although I still have a few – rarely use those stamps though they are a bit forgotten. I keep most of my clear stamps in the packaging in a couple of shoe boxes stored by company – It’s a bit weird but I really don’t like to split sets up so it’s impossible to put a lot of my sets by genre – anyway, this works for me. My cling mounted stamps are in a folder similar to yours, mostly on the laminated sheet that some companies are kind enough to supply. I do have a LOT of single word stamps and a couple of years ago I almost despaired of ever being able to organise them. Then I found a couple of storage sheets for ATCs (they have 9 pockets). I save all the out of date posters that have been laminated at work because they are great for things to stick to, cut them up and stick stamps on. I stamp the words on another bit of paper so I can see what is there. But what is really nice is my A4 folder ZIPS UP all the way round so keeps my little stamps safe. I have two of these folders from years ago, have never seen them since but like you I find them invaluable for being able to ‘flip’ through my stamps. As the stash continues to grow anything that can restore order is very welcome!! Isn’t it strange how we’re all different. This is the method I used originally and didn’t like it so I changed to CD/DVD style cases, numbered the cases and catologued them. I just flick through my ‘catologue’ make a note of the CD case number of those I want to use et voila. I dislike flicking through the actual stamps and also find that the pockets eventually ‘lean’ in the binders. Flicking through a ‘catologue’ (use the original image on the packaging or stamp the image if there isn’t one) is easy and can be done in comfort. It is funny that what works for one doesn’t for another! As a librarian by trade you woud think the idea of a catalog would appeal to me, but it doesn’t at all – I guess I like seeing the stamp itself, and don’t fancy the extra step of making the catalog itself. But thanks so much for wading in with your opinion – I think stamp organization has to be one of the trickiest things for we crafters and the more ideas people have and the more input from people who have tried and discarded methods (and perhaps most importantly WHY it didn’t work for them!) the better chance people will have to pick the RIGHT method from the start. I like the idea of numbering the CD cases – borrowing that! I’ve got all of my stamps catalogued but hadn’t figured out how to identify them on the jewel cases when they were up on the shelf (only the spine exposed).